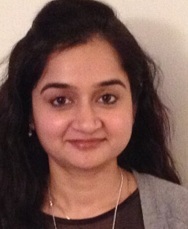 Priti Anand currently working as a senior research assistant in Case Western Reserve University. In 2009 completed MS Microbial Biotechnology. In 2004 received gold medal for outstanding academic performance at Guru Nanak Dev University. In 2009 Elected to Phi Kappa Phi membership for academic achievement at North Carolina State University. The overarching goal is to understand the epigenetic and transcriptional mechanisms that can be exploited for the development of therapeutic drugs for cardiovascular and muscular diseases. My research work is focused on studying the role of epigenetic reader proteins--BET bromodomains--in cardiac and smooth muscle biology, and cardiovascular diseases. I am also involved in investigating the role of transcription factor, Kruppel-like Factor 15 (KLF15) in skeletal muscle physiology and pathology. 2. Anand P, Brown JD, Lin CY, Qi J, Zhang R, Artero-Calderon P, Alaiti MA, Bullard J, Alazem K, Margulies KB, Cappola TP, Lemieux M, Plutzky J, Bradner JE, Haldar SM. BET Bromodomains Mediate Transcriptional Pause Release in Heart Failure. Cell 2013; 154(3):569-582. [PMID: 23911322] (Highlighted in: Nature Reviews Drug Discovery, Science Translational Medicine, Nature Publishing Group SciBX). 3. Prosdocimo DA, Anand P, Liao X, Zhu H, Shelkay S, Artero Calderon P, Zhang L, Kirsh J, Moore D, Rosca MG, Vazquez E, Kerner J, Akat KM, Williams Z, Zhao J, Fujioka H, Tuschl T, Bai X, Schulze CP, Hoppel CL, Jain MK, Haldar SM. Kruppel-like Factor 15 is a Critical Regulator of Cardiac Lipid Metabolism. J Biol Chem 2014; 289(9):5914-24. [PMID: 24407292]. Anand P, Munir A, Haldar SM. P-TEFb and BET Bromodomains in Cardiac Transcription and Heart Failure Pathogenesis. eds. Backs J and McKinsey TA, eds. Epigenetics in Cardiac Disease. in press Springer, 2015.